And here’s the fabric line, super cute and this year’s colour of the year Splash! matches purrfectly. Yes. I did that. Yes. I too rolled my eyes. The blocks come together quickly and easily. 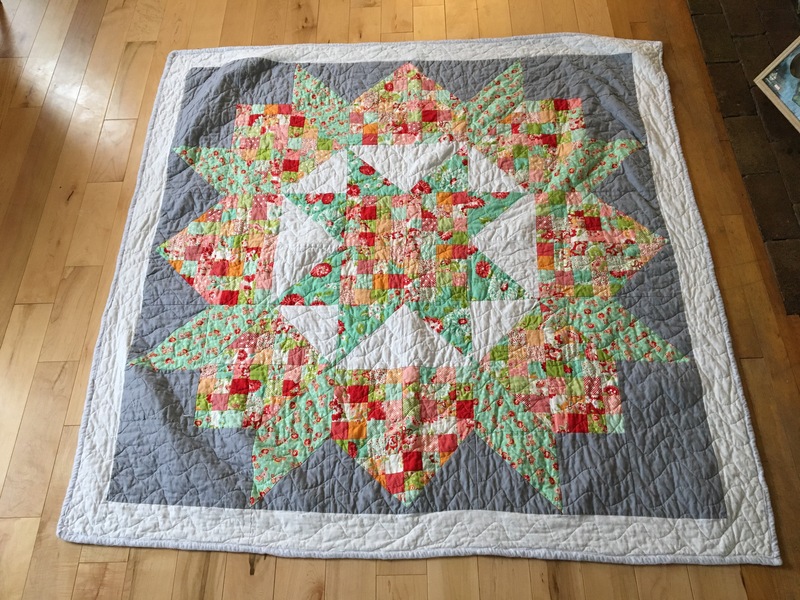 It’s a great quilt for a beginner for sure. English Paper Piecing, EPP to most. Hand sewing. Basically, everything that has scared and intimidated me since I began quilting. I used to think, “Oh, I could never! Who would have the patience for that kind of nonsense?” Well, as it turns out, I do. I have always loved the look of hexies, and can remember a Smitten quilt hanging in one of my favorite shops in Calgary. I loved the details, the itsy bitsy stitches, and how beautifully it came together. It was the last thing on my list of “I should try…”. Until it wasn’t. I picked up the pattern and clear plastic templates shortly before leaving Calgary, because where the heck would I find those in the Maritimes? Good call, because I still haven’t found any here. 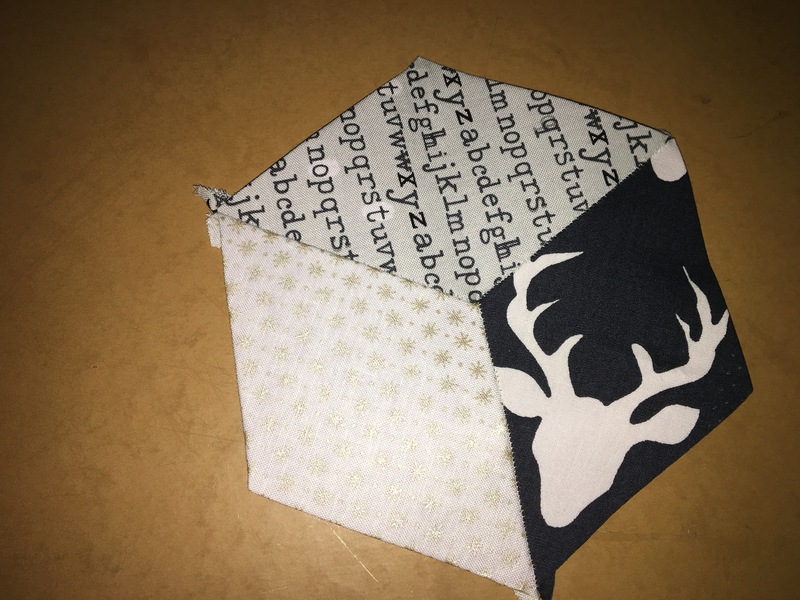 It turns out, hand sewing, and EPP in particular, are incredibly relaxing and calming for the mind. Which, when you suffer from PPD and PTSD like I do, is a Godsend. It’s perfectly blissful work, and I’m loving getting to cut up some of my favorites in my stash. I have every reason to believe that this will be an absolutely hideous quilt to the eye, as the mix of patterns, prints, and colours are going to be an assault on the senses. But I’m not letting that get to me. I started in May, and figure I’m about 85% of the way with my blocks. And since I’m putting so much time into this quilt, I may as well go big or go home and am planning to quilt it by hand as well. Yes, I know. Right? I swore I would never. Could never. But I’m going to. And I’m going to use the most obnoxious boldly coloured threads I can find. As part of #swoonalong2017, I finished the top for this Patchwork Swoon quilt relatively quickly, but didn’t get it quilted and bound for ages. It’s finally done. I backed it with some fuzzy flannel as requested by Little #2. 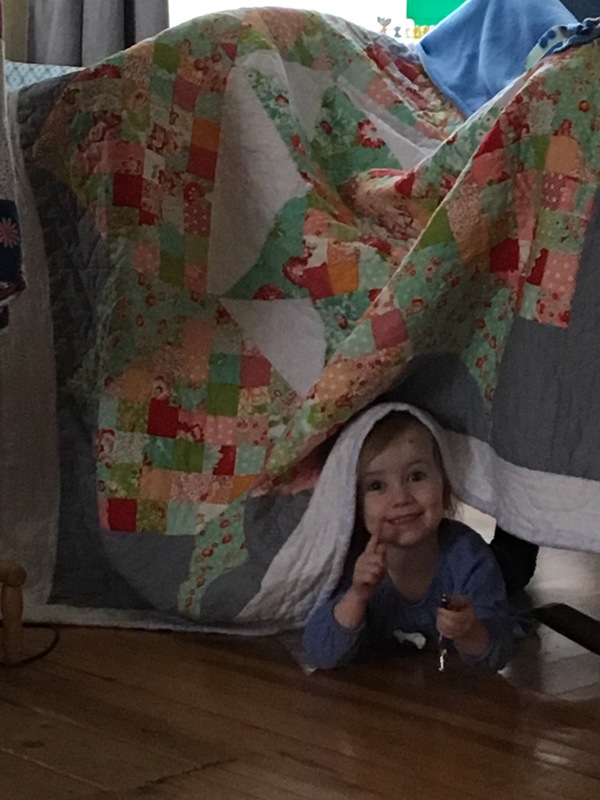 Little #3 quickly stole it to use in a fort, but once she’s gone to bed, 2 has said she’s stealing it back because it’s ‘so cozy’. 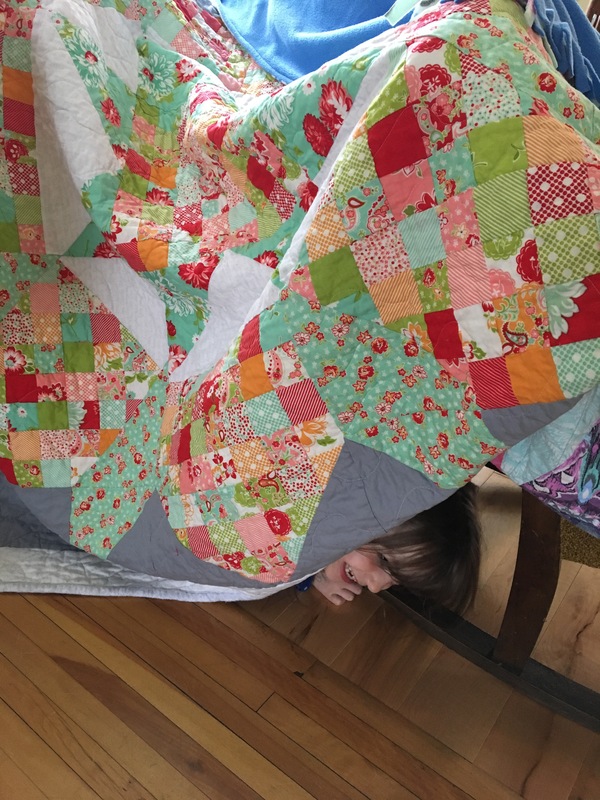 The pattern is a variation of @ThimbleBlossoms http://thimbleblossoms.bigcartel.com/product/patchwork-swoon-pattern-200-paper-pattern original Swoon quilt, and comes together beautifully. It’s perfect for jelly rolls, and since I had found a long lost Scrumptious jelly roll hiding in the shelves at my LQS, the timing was just right. Swoon patterns, Bonnie and Camille fabrics, the two go hand in hand like that perfectly sweet couple who have been in love since they first set eyes on each other. Over the last couple of years, the original Swoon pattern has been tweaked by Camille Rosekelley to include a mini pattern, a patch work pattern, and a Swoon 16 pattern. FYI, they’re all gorgeous and look so beautiful using any of the fabrics from the countless B&C fabric lines. 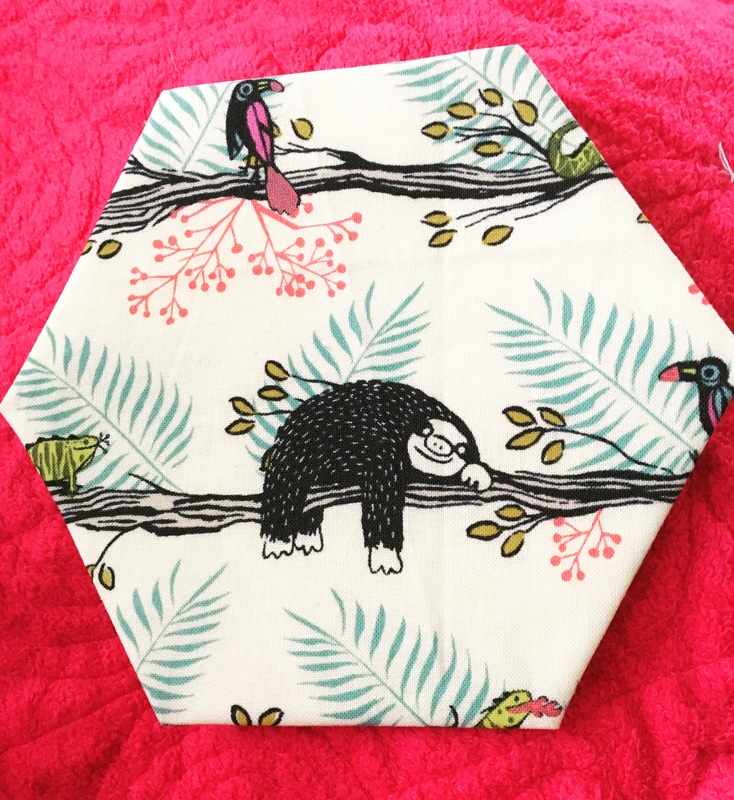 My love for Instagram is no secret (hello inspiration) and the #swoonalong was the push I needed to complete not one,( well, okay, I’ve only actually completed one so far) but two of the Swoon patterns. I managed to finish the original (that I started last year -whoops) and get the top done of the Patchwork version. Love them. They come together in such a beautiful way, and if you haven’t done one, I highly recommend it. They are a classic. It’s no secret that I adore Instagram. Endless inspiration comes from every angle there. As it turns out, so does a swift kick to the arse to get me sewing. There are several sew alongs that I would love to participate in. What’s a sew along? 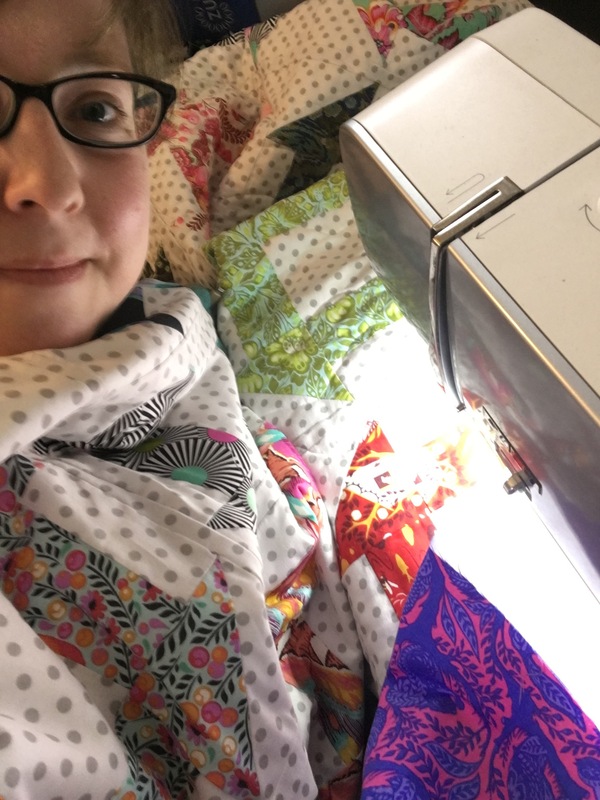 On Instagram, it’s where who ever would like to, commits to completing a project and updating their progress with photos using the same hashtag as others who are committed to the same sew along. One of the ones I joined this year is #swoonalong . Swoon is a quilt pattern designed by Camille Rosekelley of Bonnie & Camille. Currently, there are four versions of the pattern. The original, mini, 16, and patchwork. I had started an original Swoon last year, but only ever finished three blocks. The blocks are big, and at the time I was sewing on my dining room table and packing it up each time we had a meal was getting frustrating. Eventually, it was placed in a bin for ‘later’. The #swoonalong was great for getting me back at it. It is so helpful and inspiring to scroll through all the gorgeous blocks, colour combinations, and works of everyone taking part. Kind of like how Show and Tell at a guild meeting puts you in the mood to sew, so can a sew along. 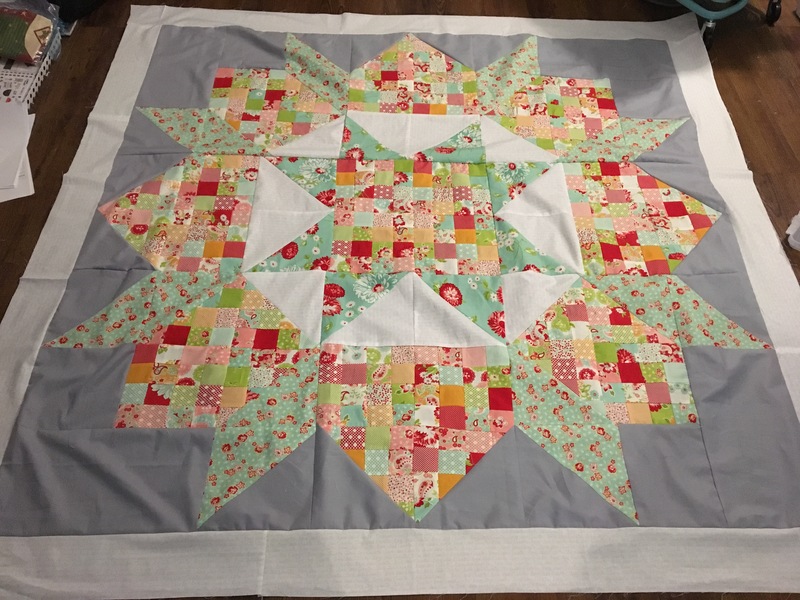 When I signed up, I had no intention of doing a Patchwork version, but after seeing all the photos of how beautiful they turn out, and having a jelly roll of Scrumptious on hand, I started and was finished the top in just a few days. Here’s some photos of the process.